Investigate this cult in Gnisis that may try to move against the Emperor. Talk to an Imperial Guard. Speak with Oritius Maro, and convince him to let you in the Talos Cult. Enter the Talos Cult's shrine and find proof of a conspiracy. (Optional) Report Back to Darius. Kill Oritius Maro and Arius Rulician. General Darius at Madach Tradehouse in Gnisis will ask you to investigate a plot among some of the legionnaires against the current Emperor, Uriel Septim VII. 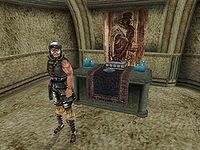 Speak to any Imperial Guard to learn that Oritius Maro is a member of the Talos Cult and suggests you talk to Prefect Optio Bologra, both in the town's Barracks. This requires a disposition of at least 70. Talk to Maro with a high enough disposition and he'll invite you to join the Cult, and will give you the key to the Talos shrine if you accept, telling you to speak to Arius Rulician. Enter the shrine (trapdoor in the storage area) and talk to Rulican, who will tell you to feel free to take a look around. Do so, and pick the lock on the chest on the altar to find a note from Maro mentioning that they need to strike quickly while Uriel Septim VII is in Vvardenfell. If you aren't in stealth mode, once you take the note, it is likely that Rulican will attack you (as might Maro if you see him on the way out). If you did not kill the two members already, Darius will ask you to do so after receiving the note. Return to Darius when you've got the note for his congratulations. This is the last quest offered by Darius. This quest was originally supposed to be given to you at the rank of Champion, but that was changed by Todd Howard. He left a message saying, "...should never get this, took out rank requirement for Talos quest, todd 1/15/02" in the Construction Set. There was originally another quest following this one. Called "Blueprints", the quest involved tracking down the schematics for Anumidium for Emperor Uriel Septim. The quest was removed from the final game. If you wait until after you deliver the note, the game might consider the attacks unsanctioned - even if Maro attacks you first. You will receive a bounty for assaulting him, and another 1000 for killing him even if he's already attacking you! As if this wasn't bad enough, every legionnaire in the building will swarm upstairs to put you to death. Just let Arius see you steal the note, then kill them both to finish the quest without a bounty. In case you already delivered the note to Darius, the easiest way to deal with Maro is to let him attack you, then retreat into the storage room, close the door and kill him, then go to the basement and finish the task. You can simply walk out the front door without any of the other legionnaires attacking you. If you discover the Talos Cult (by visiting the shrine and talking to Arius Rulician) before starting the Widow Vabdas' Deed quest, you will be unable to complete that quest, as Darius will keep asking for proof of the cult's conspiracy against the Emperor. 10 Darius suspects that some of his troops involved with the Talos Cult are involved in some sort of conspiracy. Darius asked me to find proof of this conspiracy. 20 I've spoken with Oritius Maro, and it appears he is a member of the Talos Cult. He has given me a key to a shrine in the basement, and told me to speak to Arius Rulician. 30 Arius Rulician has welcomed me into the shrine, and allowed me to look around. He says the cult has "plans," and that they are always looking for those who have similar beliefs. 50 Darius thanked me for bringing him proof that some of his troops are conspiring against the Emperor. He authorized me to bring the Emperor's justice to the traitors Oritius Maro and Arius Rulician. 100 Finishes quest Darius thanked me for bringing him proof of his troops' treasonous plans and for enacting justice upon them. This page was last modified on 5 November 2018, at 04:20.